Maybe it’s the inescapable influence of This Is Us, but TV flashbacks are really having a moment in 2018. This week there’s barely room for the recently resurrected Coco to make a quip or Madison to get in a new bid for a GIFable moment before the show heads back in time, long before special-ed teachers were forced to eat legs roasted by amateur chefs by the sea. Three years ago the bunker wasn’t populated by a group of lucky apocalypse survivors in period formal wear, it was full of young warlocks, testing their powers while dressed like Revered Hale from your local high school production of The Crucible. In this reality, the head warlock (who was probably chosen for his excellent taste in capes) explains warlocks are never able to rise up the magical ladder where the witches, a.k.a. women, reign supreme. And so launches an episode-long, wink-nudge examination of the patriarchy. The warlocks are considered less than. They will never have the same opportunities the witches do. Their fates, as a group, are decided by the witches, who interrupt them and belittle their ideas in formal meetings. The whole thing plays like the outline for a Black Mirror episode. Doesn’t this look vaguely familiar, but slightly off in a way that reminds you of the gravity of the real-life situation? So Hogwarts School of Wizardry and Hurt Feelings is looking to finally show these women who should be in charge (because even in a society where women have held the power for centuries, the men folk still feel the head of the table is their rightful place), and they think they might have found it in Michael, who circa 2015 is just a scared teen in a muscle shirt, getting into trouble with the law then making the detective’s head explode. The school invites the potential new warlock on the block to study in their wood-paneled underground home, and within a month he’s not just passing his OWLs, he’s almost killing his teachers when his indoor-snowstorm demonstration quickly becomes a Day After Tomorrow situation. Things briefly seem to return to last season’s Cult, the extended 2016 election metaphor, as the warlock council discusses their exciting near death experience at the hands of their young student. Sure, he could be dangerous, they concede, but he could also be the one who’s so different, such a wild card, he’ll get them the place of power they crave. In the world of the witches, things aren’t nearly as angsty. Mallory, whose bloodline apparently goes all the way back to Salem, is turning flowers into butterflies under the tutelage of Zoe (Taissa Farmiga). Cordelia is completely comfortable in her position as Supreme. Myrtle continues to have the best one liners. When they’re summoned by the warlocks for a meeting and the guys float the idea that they might have a student more powerful than a Supreme, an Alpha, they’re quickly dismissed by Cordelia and company. It’s fascinating to see a depiction not just of women in complete power, but men so resigned to it (even if you know they’re going to rail against the injustice of it all among themselves). The witches must, by TV law, walk in and out of all buildings in slow motion, the camera panning over their flowing garments, to a song that could also be played over a commercial featuring a woman slowly but powerfully eating a Dove bar. But the most dramatic moment of the night comes when the three women of the coven are met by Michael, who has done what Cordelia admitted she could not—save Queenie (Gabourey Sidibe) from the Hotel Cortez (though he does not save the show’s audience from having to sit through one more past season dropped into this already overstuffed episode). After springing Queenie, he pops down to Madison’s hell, customer service at a department store, and gets her out, too. The sight of two coven members she never thought she’d see again seems to undo Cordelia, who collapses on the doorstep of the warlock’s school. There’s always a risk to shows looking back at their past—the nostalgic goodwill gained can morph into frustration over the current state of the series. This week’s return to Coven gives viewers just enough witchy screen time to clarify how well done season three was, and highlight what Apocalypse has been missing—compelling relationships, even antagonistic ones, between the characters. Nearly the entire cast was killed off last week, and the loss was barely felt. Next week, AHS will predict the future in a scene taking place in the past. Maybe next season will be American Horror Story: Time Machine? When Michael entered the room full of his fellow baby warlocks, the Dalton Academy vibes were so strong it seemed, for a moment, like the magical youths might break out into an a cappella version of “Teenage Dream.” Is it possible Ryan Murphy is feeling a little Glee nostalgia? As always, the witches’ outfits are on point. Madison is rescued from hell and immediately asks her rescuer to hook-up. The girl’s priorities have not changed. 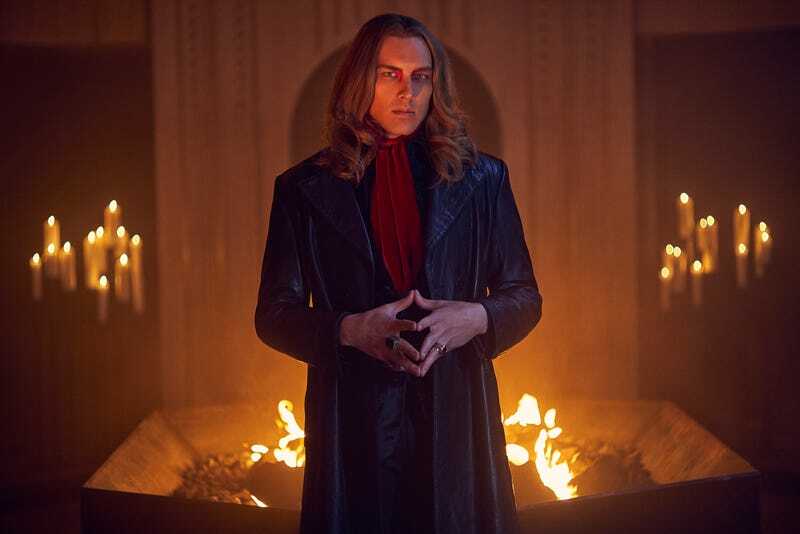 Of course a pressing question for next week’s episode is when did Michael flip the switch from mild mannered, if ambitious student to slick murderous antichrist, but a better question might be, when did he elevate his style from early 2000s skater teen to 19th century vampire king? Where’s Billy Eichner, and how pissed is he going to be that after surviving a nuclear wasteland for a year just to exact murderous revenge on his girlfriend, the murder didn’t even take?